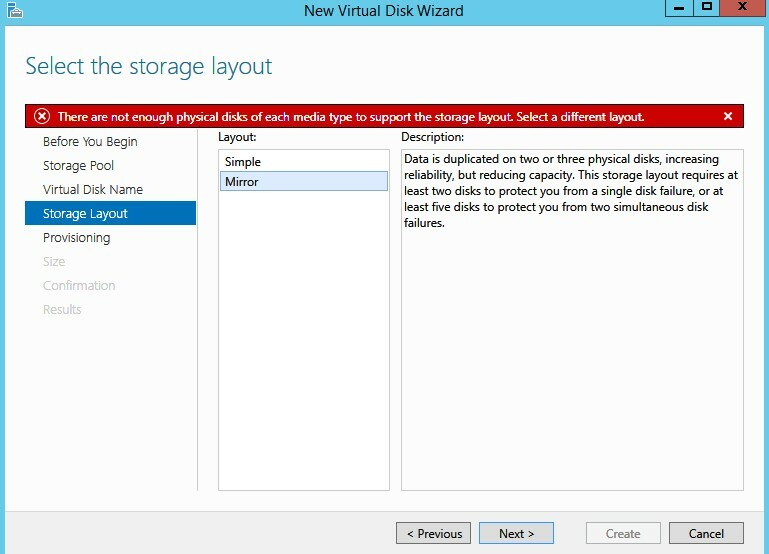 This post is to describe initial findings and facts about Windows 2012 R2 storage spaces. I decided to postpone publishing the post till the RTM ed released, and now I can tell that there is almost no change occurred and clear for me so far from the preview release. On smaller scale or home labs Storage spaces allows you to create volumes on virtual mirrored disks using unmatched physical capacities. Storage Spaces need not huge RAM amount such as Nexenta. Simply allocate and balance volume space across faster media SSD tier and slower HDD tier. 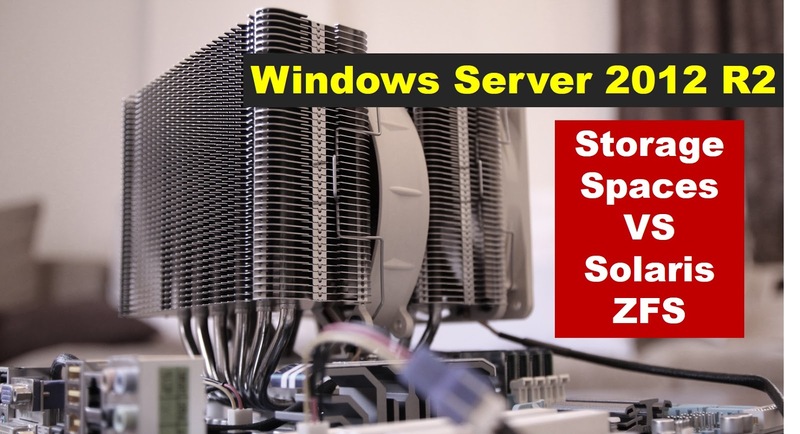 Storage Tiering – Windows Server 2012 R2 allows you to use different kind of disks and automatically moves “hot-data” from HDD disks to fast SSD storage. Write-Back Cache – This feature allows data to be written to SSD first and moves later to the slower HDD tier. Caching in RAM as an additional tier in not yet available. No option to dedicating my whole SSD drive for write back caching or modify the default size for a vDisk (1GB by default). Minimum disks for having protected and fast multi-tiered solution 2 HDDs and 2 SSDs. Resiliency for tiered virtual disk can be only simple or mirror. Parity is not possible. Tiered virtual disk can not be provisioned as thin. Very poor documentation (as in preview phase). The cmdLet "Set-VirtualDisk -FriendlyName <storage name> -WriteCacheSize <XXGB>" found on microsoft blogs but it seems it has been removed in the RTM release for some reason! At last these features from the preview version of Server 2012 R2. Hope things might change in the RTM. No change found in the RTM as well. Test below done using Windows server 2012 where multi-tiering was not yet announced. Test included 4 Stripped HDDs which considered the fastest layout you could obtain using only these number of disks. As indicated, random 4K reads are very poor which could greatly affects VMs performance if you decide to use Storage Spaces as iSCSI or NFS. Yes i know Nexenta test ran for 3 times and you can find the below 3 test runs result for Storage Spaces System. Windows Storage Spaces provide easy to use and configure and yet provides very promising features as storage tiering, combining these features with non restricted windows NIC teaming and out of the box hypervisor, all of this can make your life easier when building a testing lab, but before start relaying on Windows Storage Space many design considerations should be in mind to have overall good competing solution, especially for small systems, for example with only 4 HDDs and 1 SSD as above. 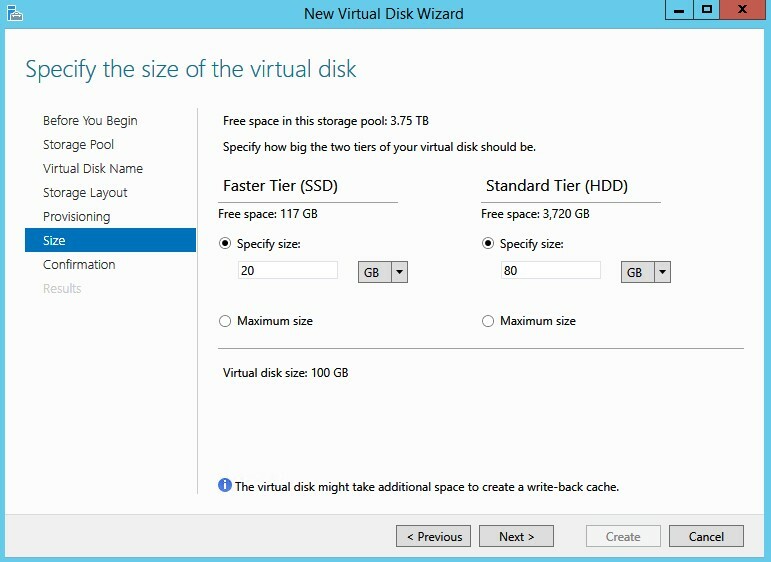 Since its not aplicable to have multi-tiered RAID 10 layout with above mentioned number of disks, we need to configure simple multi-tiered vDisk this would offer the expected performance and for the protection layer script could be scheduled for backup job, exporting vhd files to another mirrored vDisk, or maybe you should consider using third party solution as VEEAM backup utility free edition if its going to be your hypervisior storage: http://www.veeam.com/virtual-machine-backup-solution-free.html?ad=menu.